Oklahoma where the wind comes sweeping down the plain! And this is what the Oklahoma Illustrated History says about HJ Whitley. 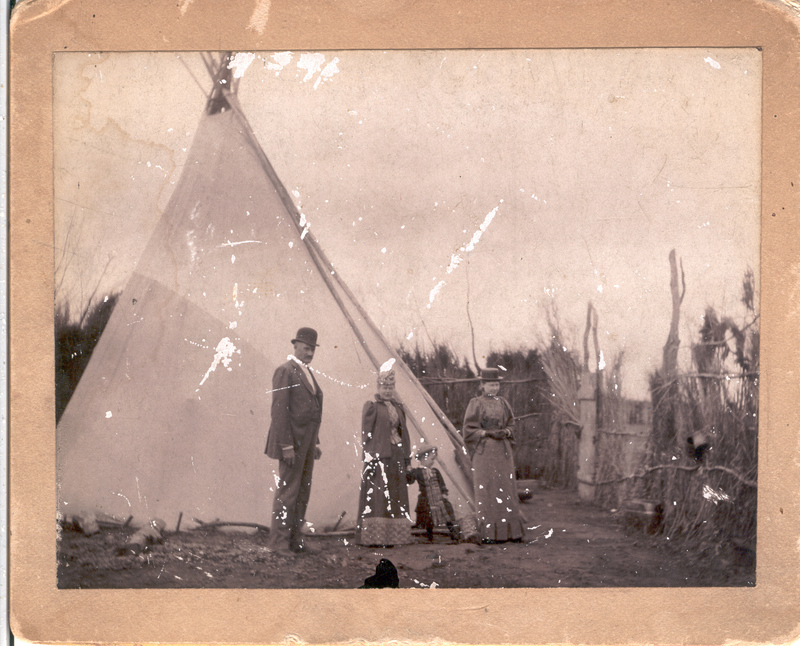 HJ Whitley, Gigi Whitley and Ross Whitley in Guthrie Oklahoma in 1889. Holy Moly! 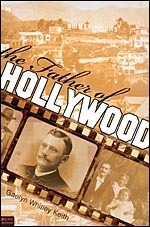 How Did Hollywood Get Its Name? Over the years I have been asked many times how Hollywood got its name. To start with I am going to share with you the way my great-grandparents said it happened. While on their honeymoon in 1886 they rode horses out to the foothills of Hollywood. They dismounted near the top of the hill to look at the view of the entire valley. Along came a Chinese man riding in a wagon. He stopped, got out of the wagon and politely bowed. HJ Whitley asked him what he had been doing. The man said in broken English, “Up early. Work hard. Hauly wood.” The man’s wagon was full of wood he had collected early that day. With that HJ had an epiphany. He decided to name the new town he planned to build there Hollywood. Holly would represent his British roots and Wood his Scottish ancestry. The next day he road back to Hollywood (Cahuenga) and obtained a verbal contract to buy the four hundred eighty (480) acres from Mr. Hurd. A handshake was used to finalize the deal. A picture of the tract of land (subdivision map) that was purchase is above. The center of the land is Highland and Hollywood Boulevard. 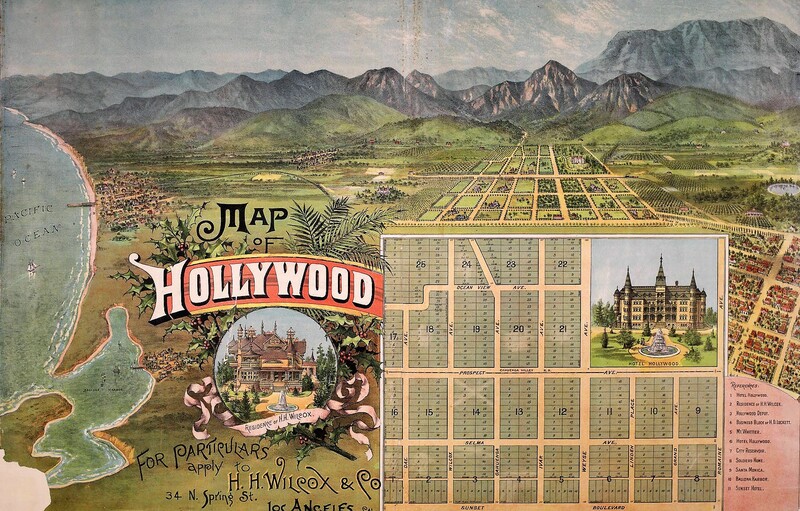 The square on the bottom right is where the Whitley Estate was located and the location where the first Hollywood Studio filmed on October 26, 1911. After securing the land HJ road over to visit with a friend Ivar Weid. He told Ivar of his plans to build a town and what he planned to name it. Ivar Weid then told his neighbors Daeida and Harvey Wilcox of Whitley’s plan. It appears they liked the name too. Harvey Wilcox purchased his land February 1, 1887. 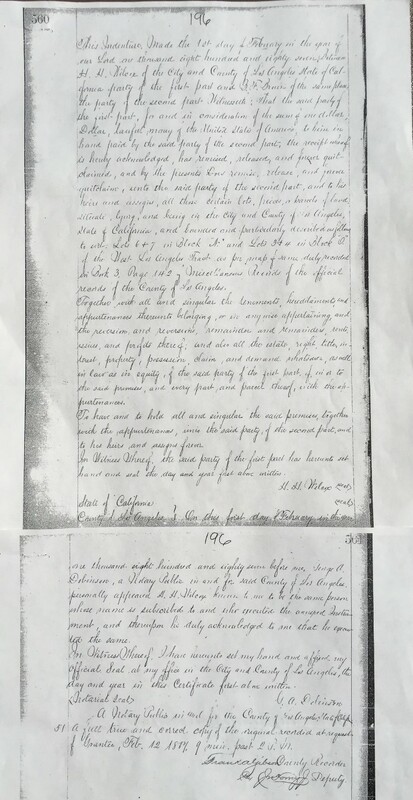 Below is a copy of the deed recorded with the Los Angeles County Recorder’s Office. 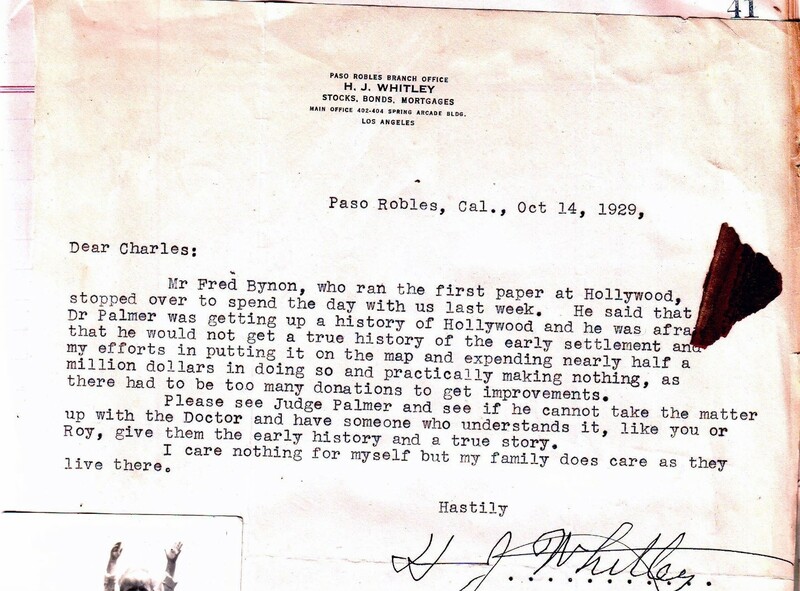 As you can see at that time there was no mention of the name Hollywood. Many people have been confused by an advertisement printed by the Los Angeles Litho Company which was produced at a later date and not filed with the Los Angeles County Recorder’s Office. It is not what a deed or subdivision map looks like. In fact, the advertisement shows that the Hollywood Hotel was there in 1887. It was not. Although the map is artistically appealing it is historically wrong. Over the years I have heard a variety of stories of how Daeida Wilcox named the town. I would like to share them with you. Since she really didn’t come up with the name I guess she just made up stories she hoped everyone would believe. Hi. Sorry for not getting back to you, but this has been a crazy week and I fear that things will get crazier next week, so I'll try to answer a couple of your questions now before I get buried. 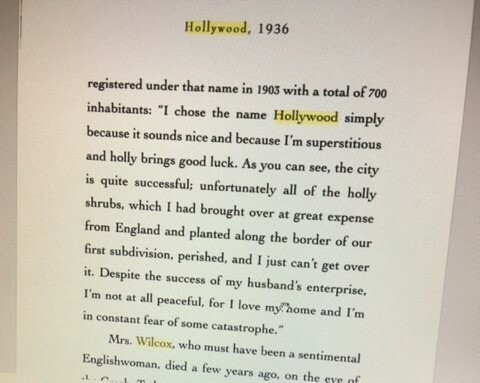 The story is that Daieida was on a train either returning home to Hicksville, Ohio or coming back to California after visiting relatives and she supposedly met a woman from Scotland who mentioned the name "Hollywood" as her supposed home. That's doubtful because the Scottish name would not be Hollywood, but Holywood, which is a village in Dumfriesshires and even if it was the name of a home, even that would probably have been called Holywood. Holly grows wild in Scotland, but I have serious doubts that holly wood would be considered the proper name for a home or a village. Legend 1 shot down. The next story comes from a book in 1936. I assume that is why for a long time the Hollywood Bowl had a sign with holly berries on it. Another claim is that Daeida happened to meet a stranger on a train who lived in an Illinois estate called ‘Hollywood,’ and that was where she got the idea for the name. The Hollywood subdivision dates back to 1893. Samuel Gross, who marketed lots to Columbian Exposition visitors, developed it. The original subdivision was in the area south of Washington Avenue. 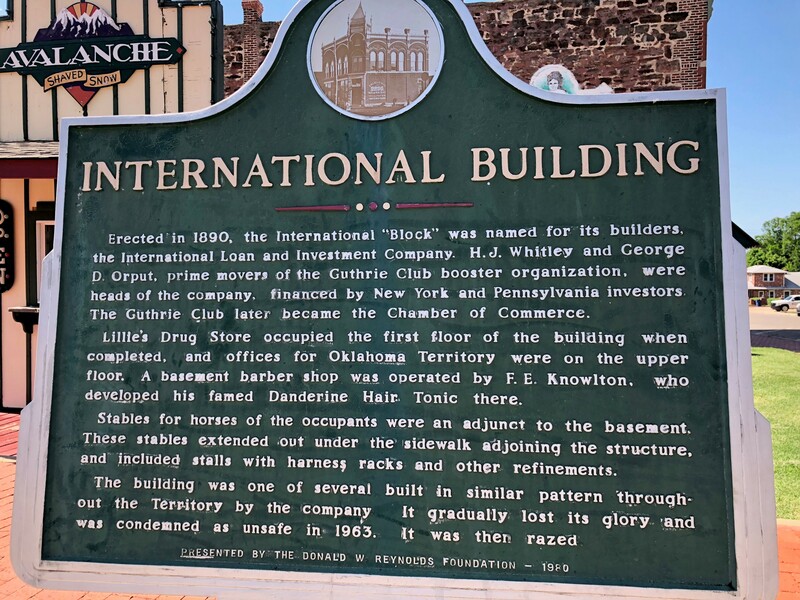 It appears that the date from this encounter was a little late for Daeida to have used in 1887.The tract north of Washington was owned by Edith Rockefeller McCormick, a gift from her father, John D. Rockefeller, upon her marriage to Harold F. McCormick. The truth is, H J Whitley named Hollywood in 1886. Located in one of Hollywood's most historic residential neighborhoods, plans for the development included height restrictions to guarantee that every home retained a view of the city below. 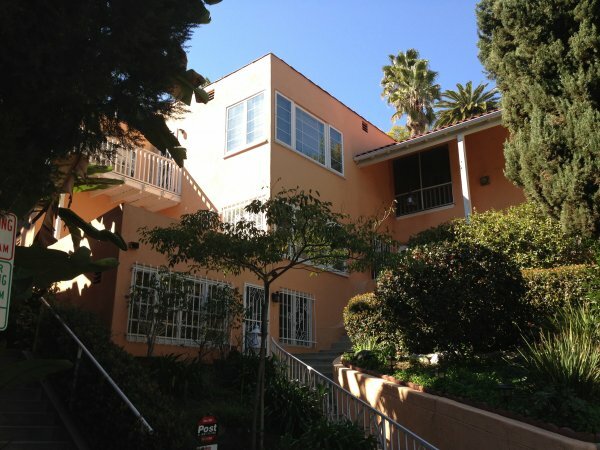 This residence is located in one of Hollywood's most historic residential neighborhoods, Whitley Heights. Whitley Heights was the last project of developer H. J. Whitley. He developed the area from 1918 to 1928 as an upper-middle-class, single-family residential neighborhood designed to resemble a Mediterranean hillside village. The concept of a hillside development was new to Los Angeles at the time, and the plans included graded roads, retaining walls, and flights of pedestrian steps. Height restrictions guaranteed that every home retained a view of the city below, and architectural design guidelines ensured that the neighborhood homes maintained the appearance of Mediterranean-style villas. This house on Holly Hill Terrace is designed in the Mediterranean style, featuring an L-shape plan that follows the unique configuration of the lot and an exterior clad in smooth-finished stucco. Over the years, this home has remained largely intact, with the exception of a two-story veranda added in 1941. The Conservancy holds an easement protecting the home's historic façade. It is one of two easements held by the Conservancy in Whitley Heights, along with a residence on Milner Road. WALKING TOUR OF HOLLYWOOD BOULEVARD! What was it like to witness Hollywood's transformation from a tiny suburb of Los Angeles to the glamorous film capital of the world? On this tour, you will learn the history of Hollywood from around 1885-1960, and have a chance to peek inside some of the hidden gems on the boulevard. Join us to learn the story of how Hollywood transformed from a sleepy little town of orange groves into the center of the world's entertainment industry...in less than 50 years! Take a walk back in time to visit the homes, shops, theaters, offices and restaurants that define Hollywood's historic identity. You'll visit the oldest residential home on Hollywood Boulevard, visit a theater that hosted star-studded premieres during Hollywood's golden age, and sip a drink where Charlie Chaplin and Douglas Fairbanks unwound after a long day of filming, and where writers like F. Scott Fitzgerald and Ernest Hemingway wrote classic American novels. Along the way you'll see how the story of Hollywood is still unfolding as the modern-day artists and creatives continue to reinvent their neighborhood while honoring its storied past. Saturday, July 22 at 10:00 a.m.
Friday, September 29 at 10:00 a.m.
Will There Be A Gondola to Ferry Tourists to the Hollywood Sign?